Emily Township: Pioneer Persistence to Equality? 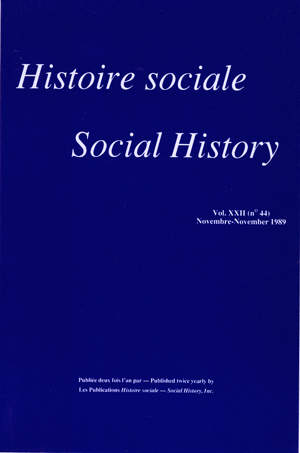 John Burnett - A Social History of Housing, 1815-1985 (second edition). Robert Carlisle - The Proffered Crown: Saint-Simonianism and the Doctrine of Hope. Richard Flacks - Making History: The Radical Tradition in American Life. Peter Fry and Fiona Somerset Fry - A History of Ireland. Michael L. Kennedy - The Jacobin Clubs in the French Revolution: The Middle Years. Marcel Lachiver - Vins, vignes et vignerons : histoire du vignoble français. Neil MacKinnon - This Unfriendly Soil. The Loyalist Experience in Nova Scotia, 1783-1791. Robert Muchembled - L'invention de l'homme moderne : sensibilités, mœurs, et comportements collectifs sous l'Ancien Régime. Roberta Pollack Seid - The dissolution of Traditional Rural Culture in Nineteenth-Century France: A Study of the Bethmale Costume. Aileen Ribeiro - Fashion in the French Revolution. Roger Sawyer - Children Enslaved. Francis Snyder and Douglas Hay, eds. - Labour, Law, and Crime: An Historical Perspective. Laura S. Strumingher - The Odyssey of Flora Tristan.